Last week, I got a chance to see The Blind Side. It’s a really good movie, and Sandra Bullock gives an excellent performance as the movie’s real star, but one o fthe things that bothered me about the film was the very beginning. 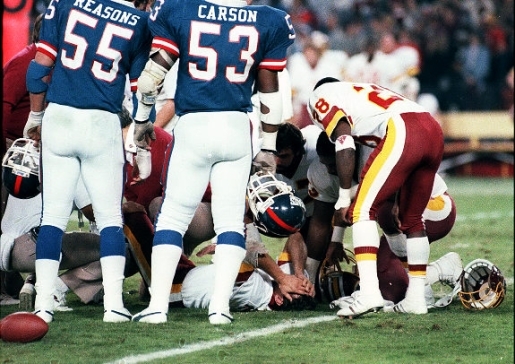 In it, the fateful footage of Joe Theismann‘s stomach-turning leg break from 1985 is played while Bullock (as character Leigh Anne Tuohy) narrates about the hit, and about the responsibilities of the left tackle on a football team’s offensive line. While the replayed footage is horrible, there are worse injuries out there, and the New York Daily News has a very gruesome gallery of sports injuries. I’ll warn you now, that gallery is nightmare fuel. It’s seriously bad. I mean, you can beat, dismember, fracture, shred, and pulverize all day long in movies and I’ll barely blink, but when it happens on the field of play in real life? I get squeamish. That’s a frightening image gallery, folks. You’ve been warned.